I love, love, love old wool blankets!!! 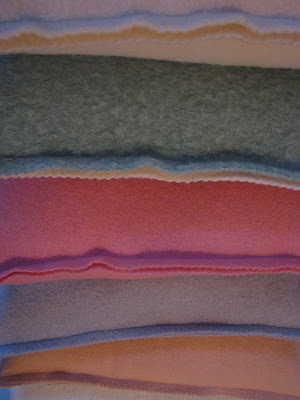 When I go thrifting, I am always on the lookout for vintage wool blankets in yummy colors... I have a huge collection, and even though I have used them to make tote bags and to cover benches, I am always on the lookout for easy projects. A while back, on a visit to my sweet friend Joy's house, I saw some pillows she had made with a vintage wool blanket, and loved them!!! I decided to recreate them: I cut sets of 20" blanket squares using a scalloped rotary blade, sewed three sides, stuffed the pillow in, then finished the fourth side! No seams to turn, no slip stitching, and in less than two hours I had whipped six pillows!! I even made one with two different sides, so you can switch sides depending on the mood... Thank you Joy for the inspiration!! Oh, what a great idea- beautiful and eco friendly! I so enjoy your blog. Hope it is ok that I posted a picture of yours on my blog. Hope someday to make it to your blog list! What a wonderful way to rescue my stack of pretty blankets. My personal joke is "maybe I can make a pillow out of it" whenever I see a pretty piece of fabric. You inspire me! You actually do it!! Oh-my-goodness! This is a project even a novice like me could do. Thank you so much for showing how to make these beautiful pillows. They look so nice stacked up together .... bet they are fun to curl up with, too! Clever idea! They came out great! 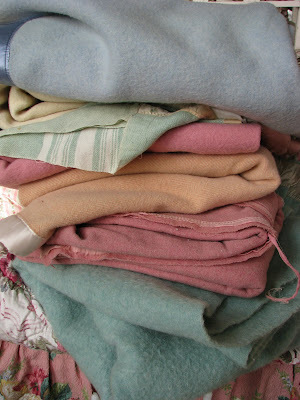 I love old wool blankets too...have some old Pendleton and camp blankets...but don't think I would cut those....these pastels look delicious! Isabel, your new pillows look so wonderful all stacked up there! Marvelous job! Great re-purposing of vintage textiles! But I have tons of wool sweaters from the thrifts stores so they would would nicely for this, felted or unfelted. once again....you totally blow me away with your projects. i love your blog and honored you with a SPLASH award on my blog. if you have time, please feel free to grab it. if you are busy, i totally understand. just discovered your blog via some other blog I lost track of. I just love it. It is so full of color, grace and elegance. This, I believe, is what a Maison Douce should be filled of. Love your blog header photo - my fave colors. Will take some more time to scroll down your older posts. I'm sure I'll find so much charm and inspiration to fill up my dreams as it's almost bed time for me. I'll be pleased if you'll visit my blog. you'll find it at http://ritashabbychicrose.blogspot.com/. Until then, Bonne Nuit dear Isabel! 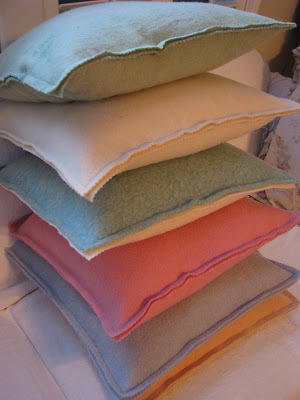 BTW love your pillows - great way to use old woolen blankets. ABsolutely yummy! I didn't even know you could be a scalloped rotary cutter. Where have I been? Love these!! love the idea! 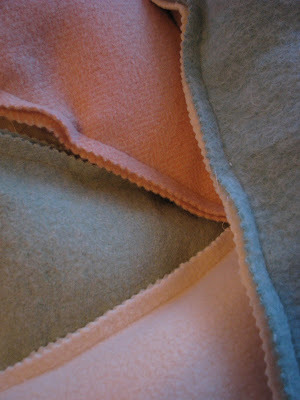 !1 no that i have my sewing machine out... and I ave a few of the blankets myself... i think i might just whip one up!! Thanks for sharing isabel!!! Portland Antiques Expo this weekend!